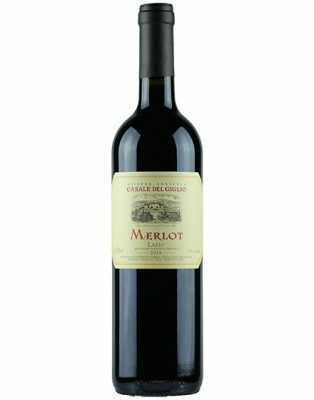 100% Merlot. The pumping over and ‘délestage’ (rack and return) techniques aerate the fermenting must and favor the formation of stable color and soft velvety tannins, while the submerged cap technique, which permits a longer maceration time of some 15-20 days, produces a finished wine with greater body and better aging potential. When the wine is racked, the fermented skins are still rich in color, tannins and aromas. To capture these extracts the skins are driven gently to the soft presses by natural gravity alone, without the help of pumping. Malolactic fermentation takes place in stainless steel vats. The wine then matures for 8-12 months in small oak barrels before it is bottled and aged for approximately 180 days. A deep ruby-red wine with aromas of small red berried fruits and cherry. Characteristic herbal notes return on a smooth, well-rounded palate.